Sorry I'm getting off to a late start this week J But just think of it this way ~it's already Wednesday which means the week is almost over! Which means we are that much closer to summer and yummy weather! Well, a little has changed since my last post, but I will get to that later. For now, here is a super quick, super simple, super cheap....super cool (lol sorry, I had to) project to do in under an hour. I would say this is a free project in under an hour. But that may only apply to me because I already had all the stuff on hand. First, take 4 pieces of wood and create a square/rectangle, wood gluing each end to the other. Do the same thing with the other 4 pieces using the same dimensions. Measure the bottom base of your shape and cut out some wire with your wire cutters to match (make it a little bit bigger so you have room to staple it to the base). Next, cut out some wire the same length as each side, you determine the height. I think I made it 4 or 5 squares tall. You can make this as tall as you want so you can see the wire through the slats. Take the cut wire and spraypaint it whatever color, I chose to use just plain ol' brown. Okay, now once all is dried, both wire and wood. It is time to assemble! Staple the base wire to the base of the wood. Next, staple the side wire to the sides of the wood. I made sure that the squares were lined up the same all the way around the square. Then secure the top square to the wire making sure its line up all the way around. Easiest way to do this is to make sure that you have 3, 6, 10, or 20 (however many you decided) squares in the empty space, lining up the bottom/top lines of the squares with the line of your wood. Okay, next is to add the handles. To do this, drill two holes through the top piece of wood on both ends. Next, I got 9 pieces of jute and taped the ends together to better get through the hole. Worked like a charm. I knotted the end, and cut the tape off. Then I braided the jute until I got the length I wanted and taped the other end, sent it through the hole, knotted it, and cut of the taped end again. Do this on both sides. And for finishing touches, use a little furniture fixer upper pen to age it. And now....you're done! Easy peasy pumpkin breasy. I used mine a little bit for Easter and put eggs in it, since its still spring I guess you can keep getting away with doing that. As for now, I'm using it to house my bananas. This seriously took me less than an hour, and I used all of what I already had on hand. Can't beat that! This is for all you all that wanted me to keep you updated on our little 'farm'. 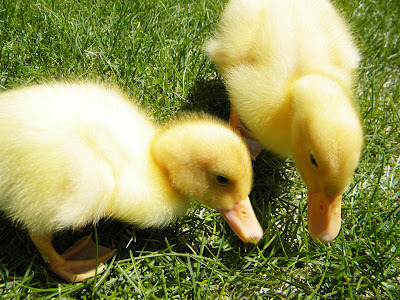 Last week was amazing with our little chicks and ducks...noisy....but amazing. Oh and a little stinky. But you kind of have to expect that. As you know we separated our ducks from the chicks because the chicks were picking on the ducks. The littlest duck wasn't eating much because of it.So, we knew for his sake they needed to be separated. Everything was going great! The older duck (at least the one we assumed to be older) was getting bigger and bigger by the minute. So much so that we started thinking that she might be at least a week or so older than the other one...or maybe even a different breed. I shouldn't have allowed myself to do this, but I became completely attached to them. I didn't know that they would become so attached to me either. Every time I left the room, they would chirp for hours on end, trying to jump out of the box...it was really cute! But I also kind of sad. Well, on Monday, I went up to check on them in the morning and found that the little one had passed. It was a really hard day...both for me and the other duck (I'm only assuming). So, needless to say, I took the other duck to work with me because I couldn't leave her in the box with the other guy's lifeless body and I couldn't bring myself to pick it up and take it out. I did a lot of research and found that ducks need to have other ducks in their lives to be happy and healthy unless I had all day to give her the attention she needed and deserved ~which I didn't. Both me and my husband work full time and there was no way I could take her to work with me every day. So, it was hard, but we decided that it would be best for her to give her to a home that she would have plenty of room to play and have other ducks around to give her company. Luckily, my husband's friend was more than happy to take her in for us and would give her just that. Not that the day didn't start out hard enough, but it ended just as hard. 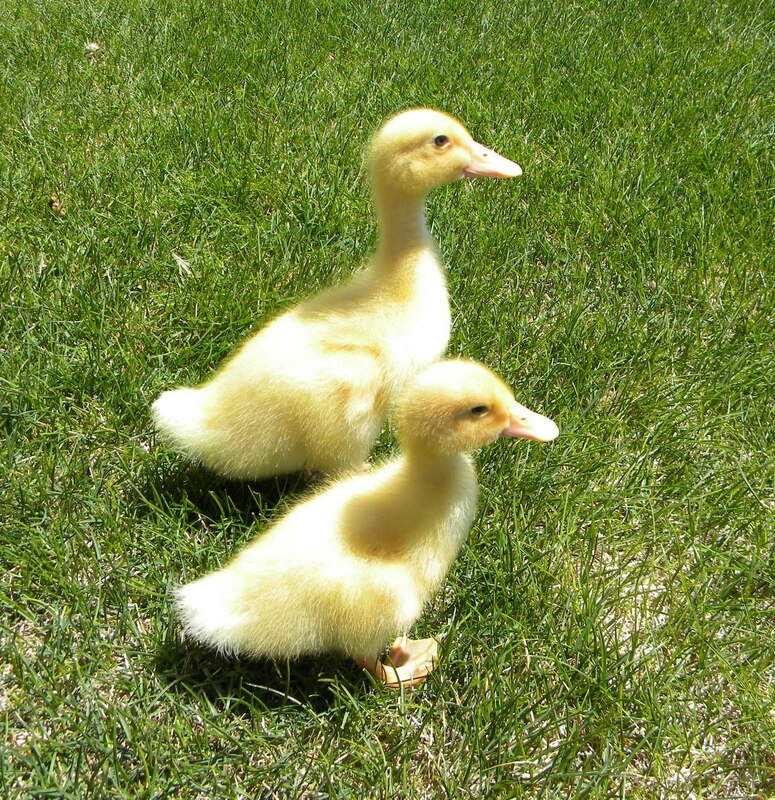 In the end, I mourn for the loss of the little duck and still miss the big duck, but I know its better for her. I would hate to see her stressed out all her days. I know we could have gotten another duck for her and kept her, but in my heart, this just seemed like the right thing to do. Thanks for the tutorial, it looks great and those ducklings are to die for.... I can't stop looking at your last picture, so cute. Alisha, I'm so sorry to hear about the baby ducky. I get way too attached, way too fast to critters too... I feel your pain girl. I totally understand your feelings about your little ducklings. You have a big heart. I grew up on a farm so animals mean the world to me. I'm very attached to my animals, two cats, a dog and two chickens. Oh, Alicia...your sweet little ducks. That just breaks my heart and now I am sad for your heart too. Are you doing better? great idea and the baby ducks are so cute! You did the best thing under the circumstances, but I know it still hurts. And yes, they are social animals and it is not good for them to be by themselves. Love this cute and simple idea. Thank you so much for sharing at Transformation Thursday! Um hello, this is great! I need one immediately. I have no wire and keep seeing cool projects using it, so I think it is time for me to get on the bandwagon and get some! I am so jealous of your chicks. my sister-in-law- and another friend both decided to start raising chickens. Of course we live in hoa neighborhood and can't do it! Good Luck! p.s. I liked this so much I clicked the follow button and am going to peek around!